The Panasonic W580 Full HD 1080p camcorder brings the joy of video creation to life with innovative features like multi-camera scene picture-in-picture recording via a second built-in camera. 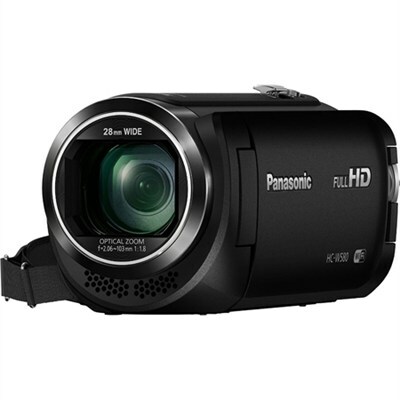 The Panasonic W580 Full HD 1080p handheld camcorder brings the joy of video creation to life with innovative features like multi-camera scene picture-in-picture recording via a second built-in camera, or by adding a WiFi link to a mobile device the camera to increase creative possibilities. A 50x optical zoom with 5-axis image stability and up to 90x intelligent zooming get you close to the action, plus an exclusive High Dynamic Range (HDR) mode brings imaging to life by reclaiming the highlights and shadows lost by most compact camcorders. Intelligent 90x zoom and 5-axis Hybrid Optical Image Stabilization provide maximum handheld stability. Wi-Fi and NFC enabled for quickly sharing content and controlling camcorder features remotely. Built in Twin Camera plus WiFi mobile device features add multi-camera scene picture-in-picture recording. High Precision AF mode improves focusing while zooming, panning and shooting moving subjects. The Level Shot function automatically detects and corrects camera tilt to let you record confidently. *Not available with 4K mode. HYBRID O.I.S.+ and 5-axis correction thoroughly suppress blurring caused by unwanted handheld shaking. By combining two images taken with different exposures, blown highlights and blocked shadows are eliminated. A dedicated HDR button enables quick mode changes. Fit more people into any shot to capture group images with ease, even in small rooms. Bring distant subjects in close with 90x Intelligent Zoom and a sharp, clear 50x Optical Zoom. A rotatable second camera is included to let you record two angles at once as a picture-in-picture effect. Built in Wi-Fi links up to three smartphones simultaneously to record picture-in-picture from multiple angles.